The 1993-94 Clinic team was the last one, and the one that finally gave a definitive answer to the question put by the Shakespeare Authorship Roundtable seven years previously: "How many of the 58 claimed "True Shakespeares" actually match Shakespeare's "known" work? Their answer, after applying 50+ computer tests to 100+ plays: none of them. And none of the plays or poems of the "Shakespeare Apocrypha" match either. Shakespeare's tested writing habits were highly consistent throughout his life, and highly inconsistent with those of testable claimants, and with those of whoever wrote the Apocrypha. Team-member resumes from their final report to the Roundtable appear below, some with updates to 2000. 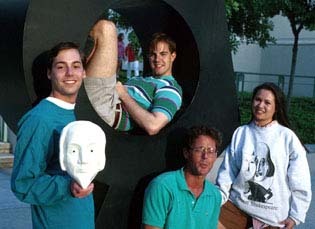 Nate McMurtray '94, of Bellevue, Washington [curled up in sculpture, center], is team leader of the Clinic, a veteran of the 1992-93 Clinic, and a senior in government at Claremont McKenna College. He is an accomplished programmer and has written Textcruncher, the Clinic's PC-based test vehicle on a special Practicum grant from the Irvine Foundation. He is a McKenna Merit Scholar and a National Merit Scholarship finalist; he has been Editor-in-chief of the college newspaper; he has been president of the Claremont Colleges Debate Union; and he has developed and marketed three games for PC: Imperium: Geopolitics on a Galactic Scale; Line in the Sky, a Missile Command spinoff; and Video Craps. He plays the viola and french horn. He also raises tropical fish. He is qualified with the epée, saber, and Japanese broad sword and has a yellow belt in Tae Kwon Do and Kendo. He is conversant with Spanish, Pascal, Basic, C, C++, Assembly, Cobol, DCL, and Lisp, but he hates Fortran. His cause is public service, specifically trade policy. His hero is Robert Kauffman. He heard of the authorship controversy from Professor Elliott. His favorite candidate is Christopher Marlowe. 2000 update: Nate went on to Harvard Law School, handled corporate megamergers as an associate of the firm of Cravath, Swaine, and Moore, New York, now sets up megamergers with Morgan Stanley investment bankers. David Terner '95, of Pontefract, Yorkshire, Huntington, Long Island, and Tel Aviv, Israel [above, bottom center], is a junior in Philosophy at Claremont McKenna College. He is a sportsman, adventurer, warrior, and world traveler, as well as a scholar, and he is no stranger to the stage. He reads Baudrillard and Kant. He has starred in six European films and TV specials. He is a master of air and sea, as well as land. He is a certified skydiver who holds the NAUI Brevet Internationale de Sous-marin. He has survived the bends from a diving accident off Sharm el-Shaikh. He is an NRA sharpshooter and a three-year combat veteran of the Israeli Defense Forces; he is a first lieutenant in the IDF Active Reserve. He is qualified on the Galil, Galilon, M-16, Short M16, Uzi, Mag (SAW), the Velda halftrack, and the Vulcan. He has blown up at least 45 terrorists and been hit by shrapnel, which has cost him the full use of his heels and some feeling in his left arm -- but not in his heart. He still has all his limbs. He is a trained mountaineer who has scaled the Suicide Face at Tsukkim, and he has tested five animals in Kung Fu Krav Maga. He holds an orange belt in Judo and a brown belt in Tae Kwon Do. He rides English and Western. He has played center fullback at soccer; he skis; he plays tennis and yellow-dot squash. He is an accomplished dancer, who has been much in demand at East Coast coming-out parties. He has studied piano under a Viennese master and hated it. He may be the only member of the IDF who also belongs to Amnesty International. His cause is to bring the West to understand the East and vice versa. He comes from a generation which has no heroes, but he admires Nishida Kitaro, the sensei of the Kyoto School, and Kokuro Satsume. He has edited texts for the Shakespeare Clinic. He heard of the authorship controversy from Professor Bessemer in the Hebrew University literature department. He has no idea who the true author is, but he is impressed by Manly Hall's article on Francis Bacon and the Rosicrucians. 2000 update: David went to the University of Colorado Law School. 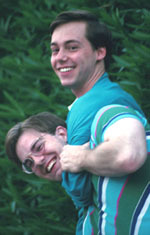 Andrew Voronyak '96, of Palmdale, California [left, in front of Nate McMurtray], is a sophomore in Management Engineering at Claremont McKenna College. He is a National Merit Scholar and valedictorian of his high school class. He has worked for NASA on programs simulating laminar-flow enhancement for F-16 fighter planes. He has never lost an aircraft. He plays piano and is a force to be reckoned with in table tennis. He loves computer video games, has the most powerful computer of any CMC student, and has blown up at least 45,000 Klingons. His cause is the Shakespeare Clinic, and his heroine is Yanira Wong. He has a yellow belt in Shotokan Karate. He knows Spanish and Basic. He first heard of the authorship controversy from Nate McMurtray and has not decided on a favorite candidate. Yanira Wong '95, of Calexico, California [ top picture, right, bottom picture, right], is a junior in government at Claremont McKenna College and a McKenna Merit Scholar. She was valedictorian of her high school class. She is acquainted with guitar and piano. She has worked at the House of Ruth, a Claremont-area shelter for battered women, and has done computer-mapped databases at the Rose Institute, CMC. She was Athlete of the Year at her high school in 1991 and has played right field for the Claremont Athena softball team. She has studied Shinto-ryu karate and is a crack shot with .22 rifle and pistol. She likes science fiction, especially the works of Robert Heinlein. Her cause is women's rights. Her heroine is Sarah Weddington. She is fluent in Spanish, French, Basic, and DCL. She first heard of the authorship controversy through reading an article on Francis Bacon at the age of ten. Her favorite candidate is Mary Sidney. 2000 update: Yanira is now at the Boalt Hall (Berkeley) Law School. 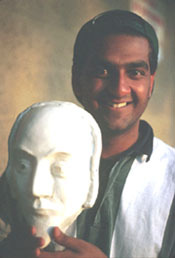 Anand Subramanian '97, of Chicago, Illinois [left, with Shakespeare mask], is a freshman in Politics, Philosophy, and Economics at Claremont McKenna College, who served in the Clinic in the Spring Semester. He is a National Merit Scholar and a member of the International Thespian Society. Among his many roles are Benedict in Much Ado About Nothing; Stanley Gardner in Run for Your Wife; Philippe in New Moon; and Proctor in The Crucible. He plays acoustic guitar, electric bass, and harmonium, sings tenor, and has written several songs, including Scratch the Surface; Need to Feel; Bowling Pin; and The Trevor Class. He speaks French and Tamil. His cause is to remove internal struggle before attempting to change the evils of the world, and his hero is Johnny Marr. He is poet and songwriter laureate of the Trevor Class, and plays Truth in the Induction and Epilogue to the Shakespeare Clinic's presentation. He first heard of the authorship controversy from Professor Elliott, and his favorite candidate is Bill Clinton. 2000 update: Anand is at the Northwestern Law School. Julie Fiedler, of Richmond, Virginia [not pictured], plays Rumor in the Induction to the Clinic presentation. She is a senior in literature and math at Claremont McKenna College. She is a Distinguished Scholar, a playwright, and a director. She has written Dex Gets a Babe; The Wedding; and Running for Wakefield. Among her many previous roles are Kate in The Taming of the Shrew; Touchstone in As You Like It; chairman in Drood; Marian Boyle in Prelude to a Kiss; Elaine in The Nature and Purpose of the Universe; and Tituba and Giles Corey in The Crucible. Her cause is life, her hero Bugs Bunny. She plays piano and has skied the Eagle Swoop at Wintergreen. She heard of the controversy from Rob Valenza. Favorite candidate: Queen Elizabeth. Sarah Stauffer '96, of Westminster, California [not pictured], is a sophomore in International Relations and History at Claremont McKenna College, and a Fall Semester Clinic member. She is a McKenna Merit Scholar, a McDonnell-Douglas Scholar, and the salutatorian of the Zhong Shan Oname Honors American Government Class. She plays the clarinet, writes short stories and essays. Her hero is Woodrow Wilson. Her causes are human rights and Wilsonian democracy. She is conversant with Russian and Vietnamese. She heard about the authorship controversy from Ward Elliott and has no favorite candidate -- yet. 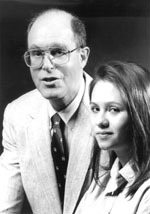 Ward Elliott, Professor of Government, Claremont McKenna College [left, 1995, with Yanira Wong], is a Harvard Ph.D. and a Virginia LL.B. His Rise of Guardian Democracy was nominated by the Harvard University Press for a Pulitzer Prize in history; he has written on smog, transportation, and population policy, as well as on Shakespeare authorship questions. He has been president of the Coalition for Clean Air; and he has held many research fellowships. He sings with the Claremont Chorale and plays guitar at student singing parties. He has served on the Claremont Bicentennial Power Lawn Mower Drill Team. He is a charter member of the Society for the Preservation of the Middle Class. Robert J. Valenza, Keck Professor of Mathematics and Computer Science at Claremont McKenna College [not pictured], was born and raised in Newark, New Jersey. He has four degrees from Columbia University. He is author of the text analysis program, Intellex. He originated the concept of modal analysis for author identification and has published several articles on the subject. He is author of Linear Algebra: An Introduction to Abstract Mathematics (forthcoming from Springer Verlag) and co-author of Abstract Algebra (1986). He defined the notion of elasticity of factorization in number fields. He has written a 70,000-line data base management program for Gould Electronics. He has done more than his share of simulation modelling and signal processing. He plays the recorder. He was lead engineer for software for RCA communications satellites, and orbital analyst or mission analysis leader for six satellite launches. He has never lost a spacecraft.